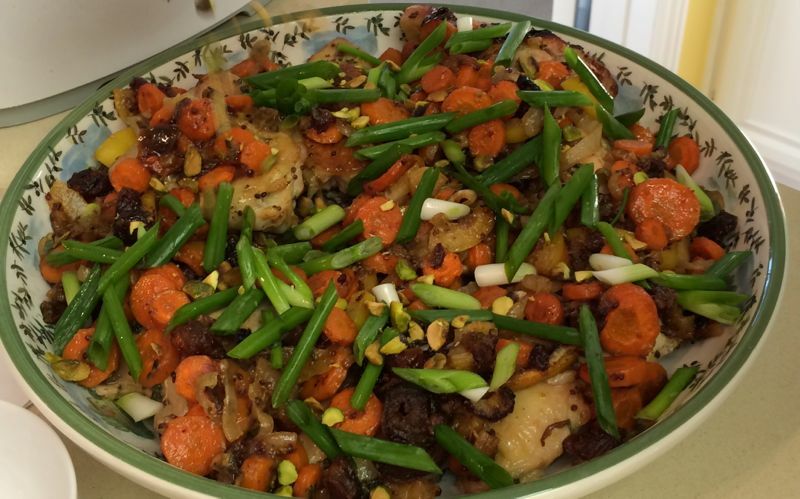 This is a modification of the recipe “Sweet and Spicy Chicken” published on the New York Times website, which I found one day while perusing the videos from Melissa Clark. She makes me believe I can cook anything. Since I am of a certain age, I crave more layering of flavors and textures and this fits the bill. We served it to two young adult guests one night and one cleaned her plate and the other one pushed most of it around. 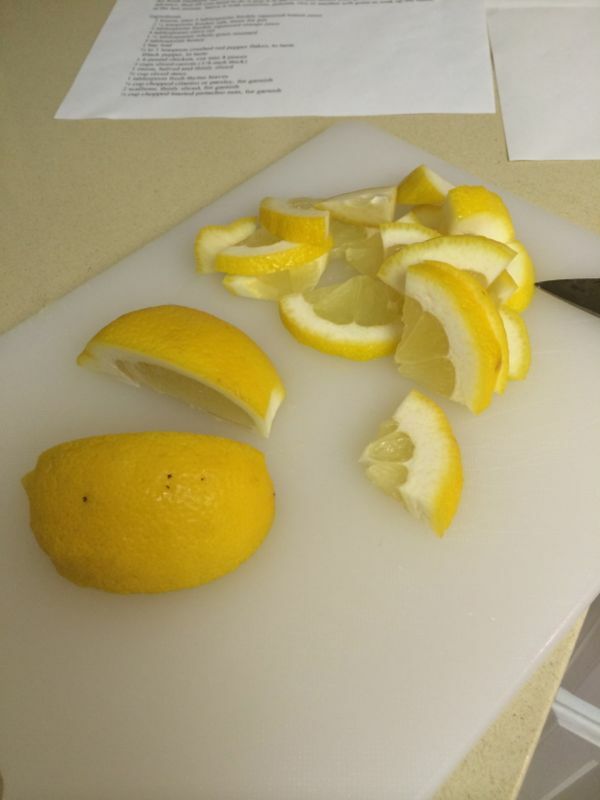 When you bite into those lemons, it’s a jolt, that’s for sure, but I loved the surprise of all the flavors together. Put chicken in a bowl and add honey mixture. 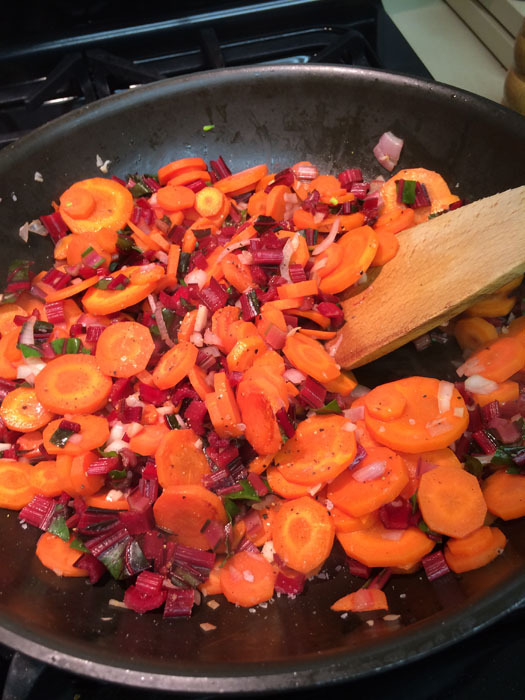 Add carrots, onion, dates, thyme and blanched lemon slices. Turn mixture several times to coat. 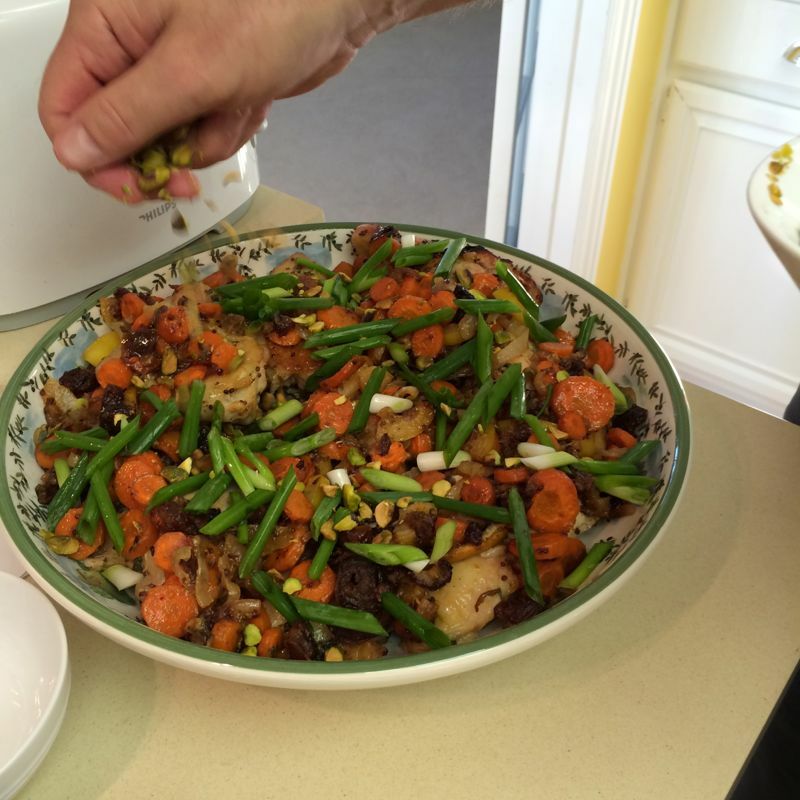 Spoon carrots over chicken and top with cilantro (or parsley or mint), scallions and pistachio nuts. This is even better the next day. I served it with Rice Pilaf, and served up some homemade cookies, and gelato from the grocers for dessert. This dish hails originally from Martha and I pretty much make it like she says, but don’t worry so much about the proportions. If I think it needs more tomatoes, I add a few. Likewise with the olives. This goes together quickly and is good for a crowd. Once I served it to over 50 people, and they all liked it (although I did see a few olives left on plates–guess they didn’t like those). 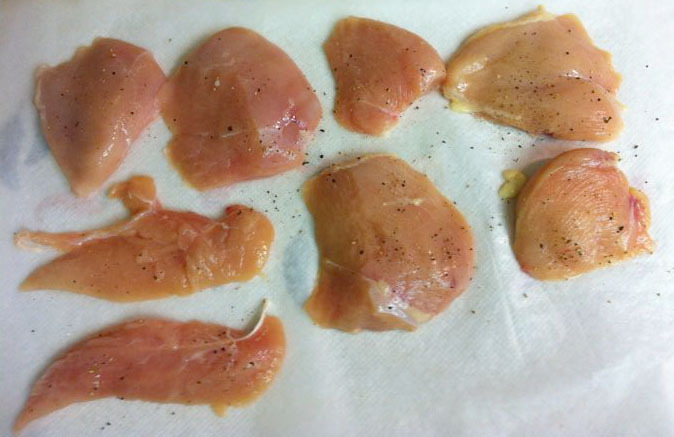 Cook’s Note: Like I’ve said before, I think the chicken breasts these days are beyond one person’s serving size, so I “fillet” them into thirds by slicing them on the diagonal, with the blade closer to horizontal than vertical. 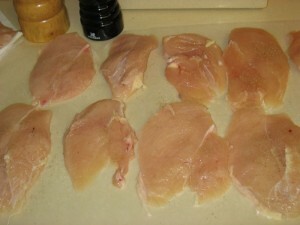 This is the yield from two chicken breasts. While the recipe originally called for 4 chicken breasts, I find that by filleting the chicken and leaving the amounts of the vegetable mixture the same, this will feed four nicely. Preheat oven to 475 degrees. 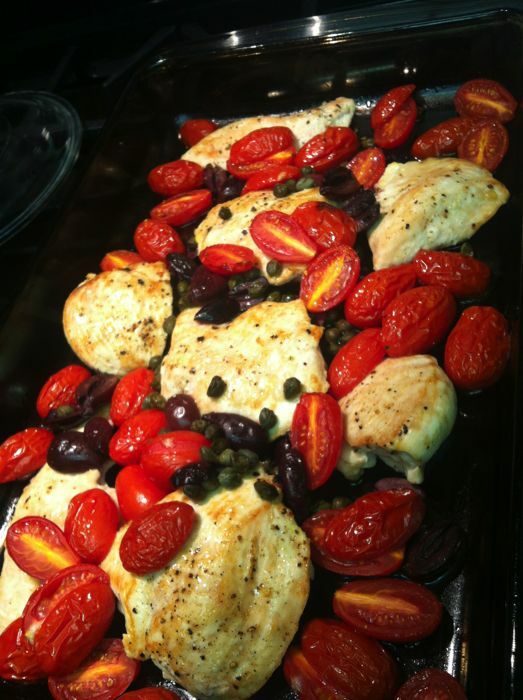 Toss tomatoes, olives, capers and 2 Tablespoons oil together in a medium bowl. Rinse chicken and pat dry. Season both sides with salt and pepper. Heat a large skillet over high hot until hot. Add 1 Tablespoon oil and heat until hot, but not smoking. 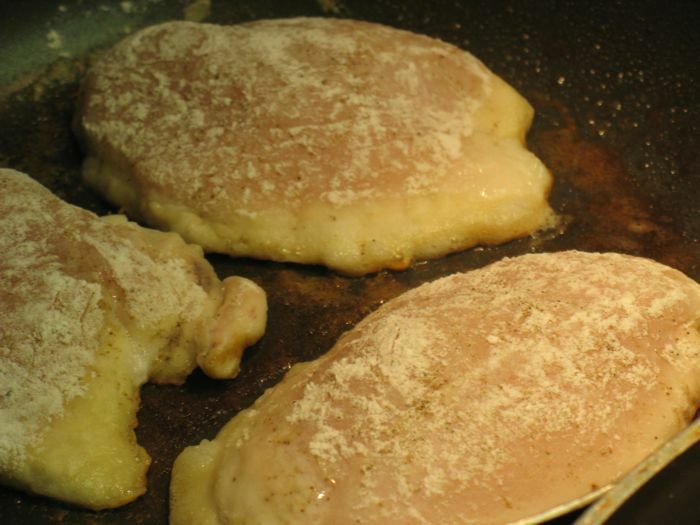 Place chicken in skillet; cook until golden brown, then turn chicken over to sear the backside briefly. 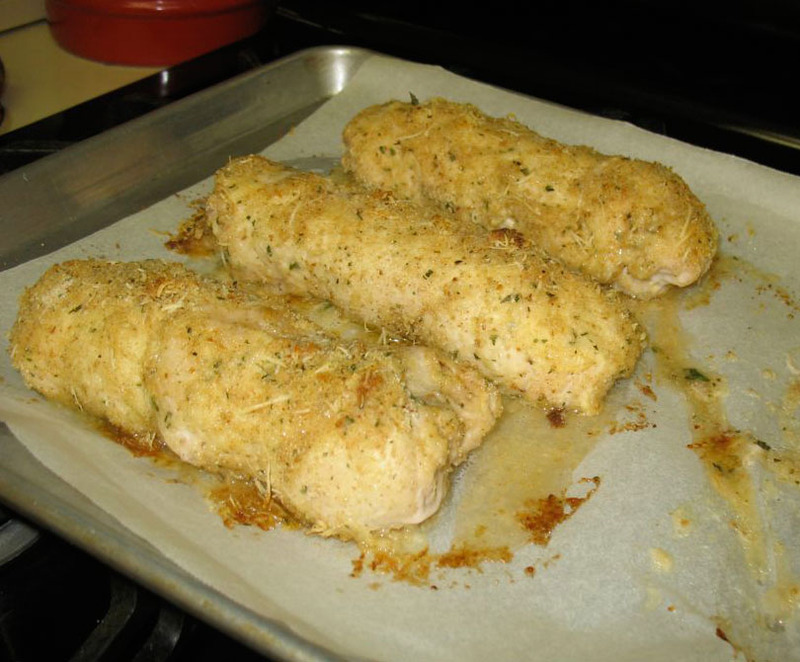 Place chicken in oven-proof baker. Add tomato mixture all around. Roast until chicken is cooked through and tomatoes have softened, about 18 minutes. Note: Martha says to use an oven-proof skillet, then you can just add the tomato mixture to the pan and pop that in the oven. Now you have options. 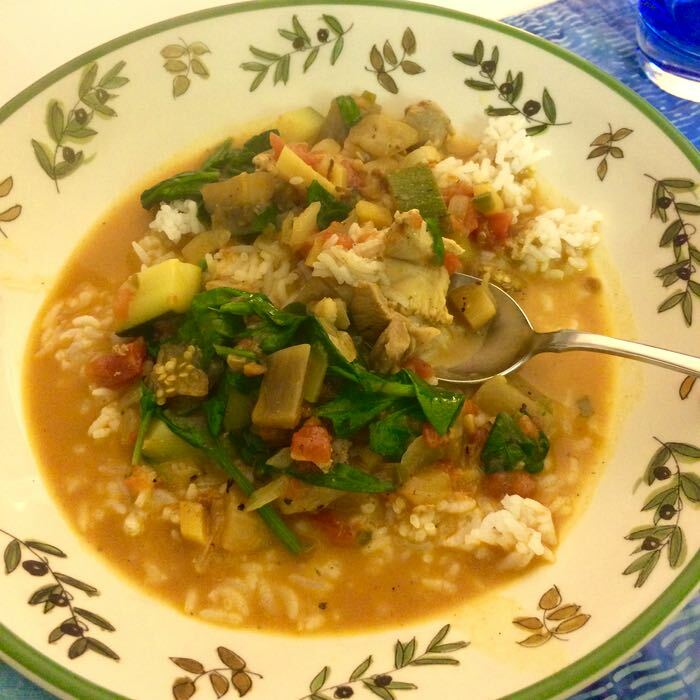 Sometimes I’ll got looking on the Epicurious website for quick recipes that are flavorful. This is one of them, originally published in Gourmet magazine in August 2004. I was trying to find another marinated chicken, one I’d made before, but couldn’t. This one is just as good as the other that is now lost forever to the vagaries of the internet. 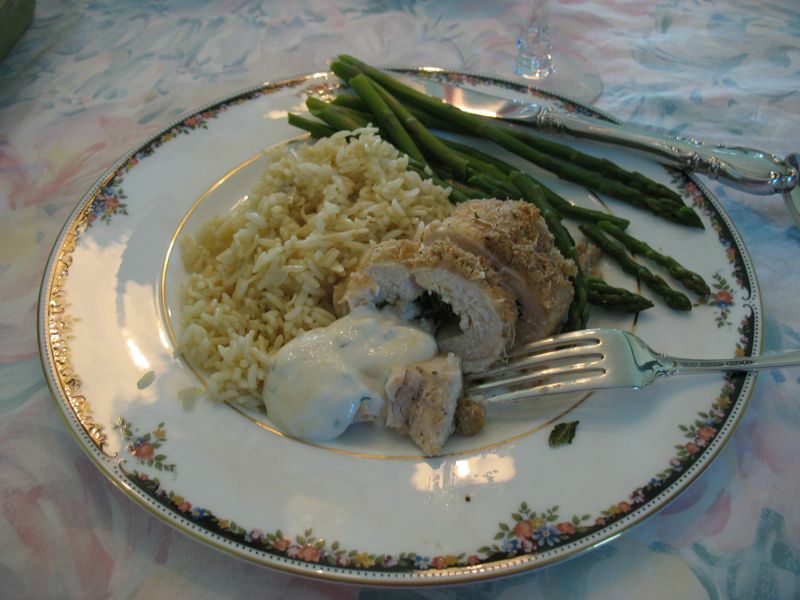 But it is quick: just whisk together the marinade, then while the chicken is marinating, stir up the yogurt-sauce topping and the mint “salad.” Yep, I thought it was a strange name too–it’s really just a garnish for the chicken. See the Memorial Day Barbecue post for how the whole thing looks with the sauce and the garnish on top. Whisk together 1 cup yogurt, 2 tablespoons oil, 1 tablespoon lemon juice, salt, and spices, then add chicken and turn until coated well. 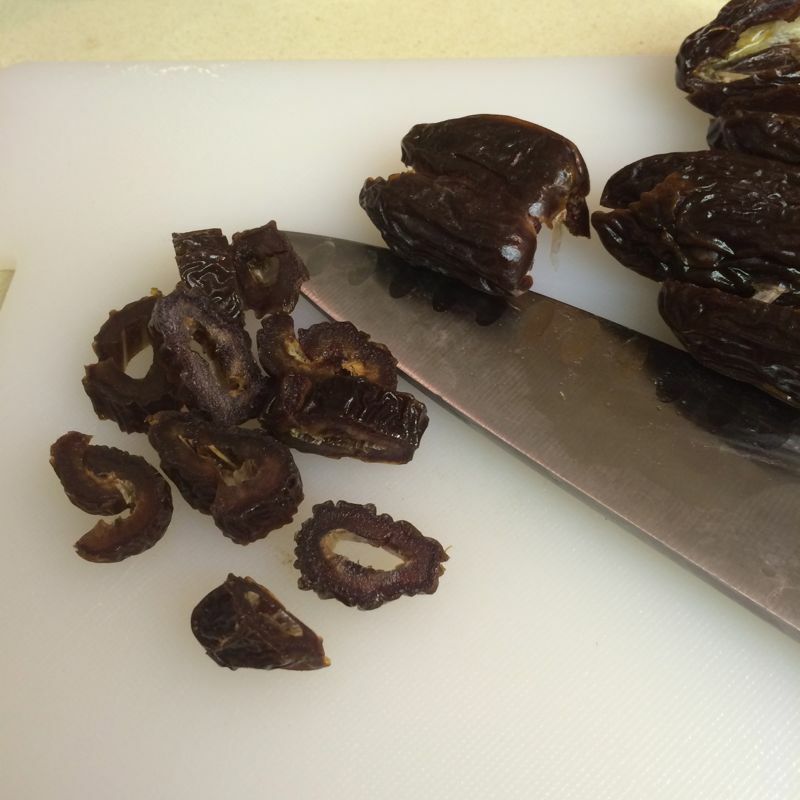 Marinate at room temperature 20 minutes. While chicken is marinating, prepare grill for cooking. If using a charcoal grill, open vents on bottom of grill, then light charcoal. Charcoal fire is medium-hot when you can hold your hand 5 inches above rack for 3 to 4 seconds. If using a gas grill, preheat burners on high, covered, 10 minutes, then reduce heat to moderate. 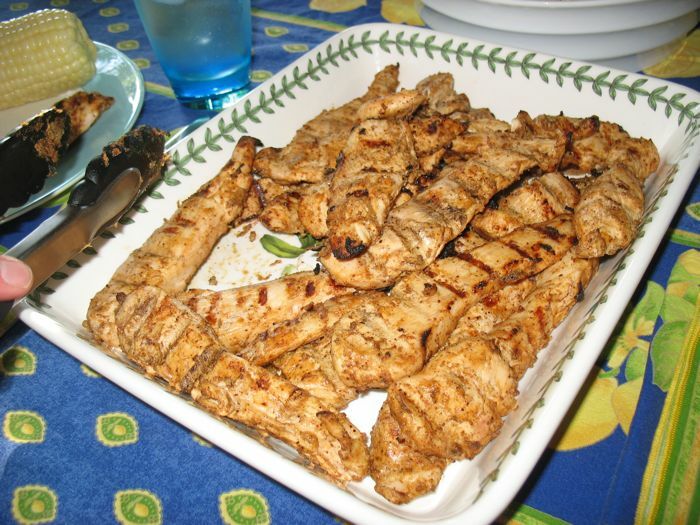 Grill chicken (discard marinade), covered only if using gas grill, on lightly oiled grill rack, turning over occasionally, until just cooked through, 10 to 12 minutes total. Transfer chicken to a platter. 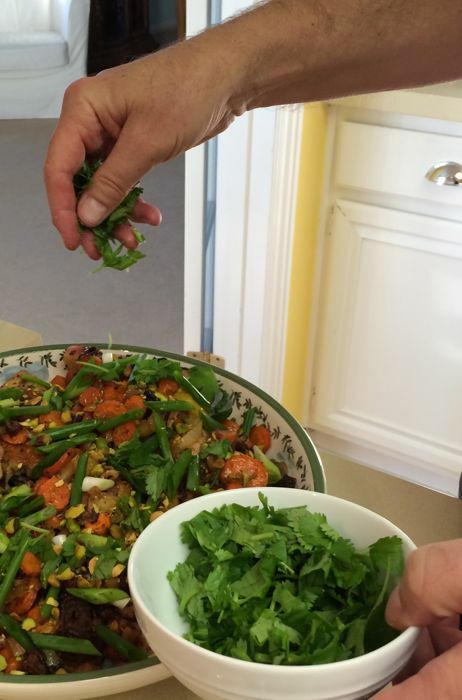 Toss together mint, shallot, and remaining tablespoon oil in a small bowl. 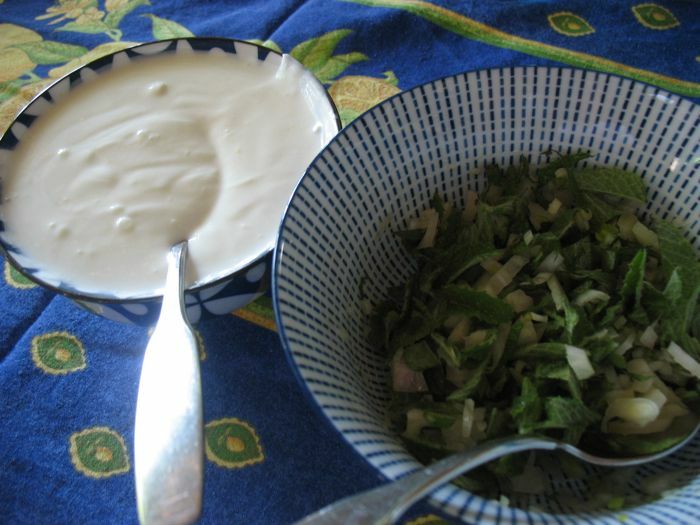 Drizzle chicken with yogurt sauce and top with mint “salad.” Toppings are shown to the left. If you aren’t able to grill outdoors, chicken can be cooked in a hot lightly oiled well-seasoned large ridged grill pan over moderate heat. I opened the Williams-Sonoma Cookbook again, as it was my husband’s birthday. As I mentioned before, the celebrations of lots of noise and gifts and crazy fun have ebbed, and have been replaced with a quieter dinner on fine china. This is a direct result of our nest emptying out. 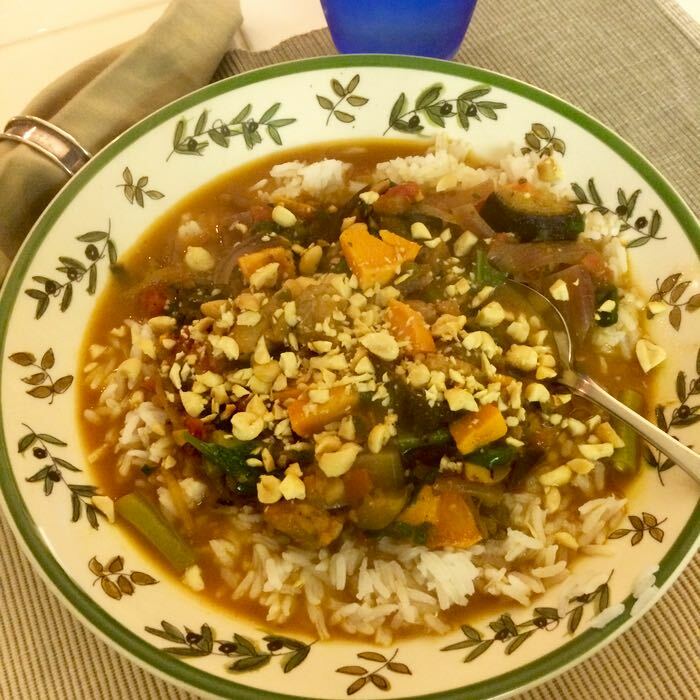 While I miss (always) the happy parties with lots going on, I think this new tradition works well for us as well–challenging me as a cook to find new recipes. 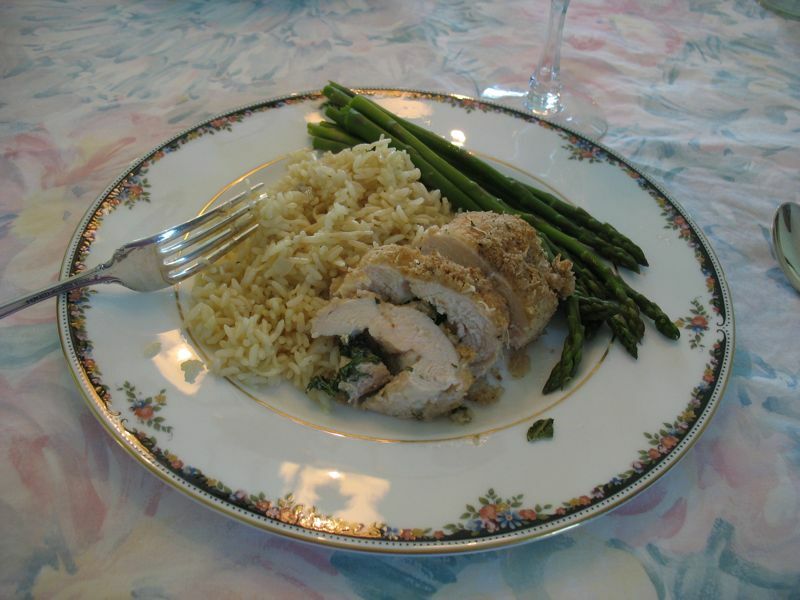 This is a simple rolled-up chicken breast with a twist: no cheese and ham on the inside. Instead chopped basil and salt and pepper provide the flavor, augmented by a yogurt mustard sauce. 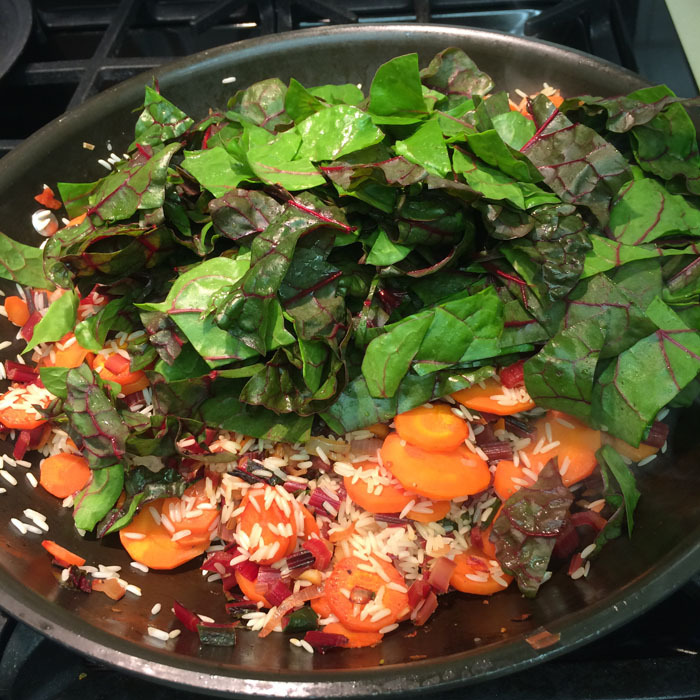 Sometimes I think I’d like to write a recipe like it happens in my house. 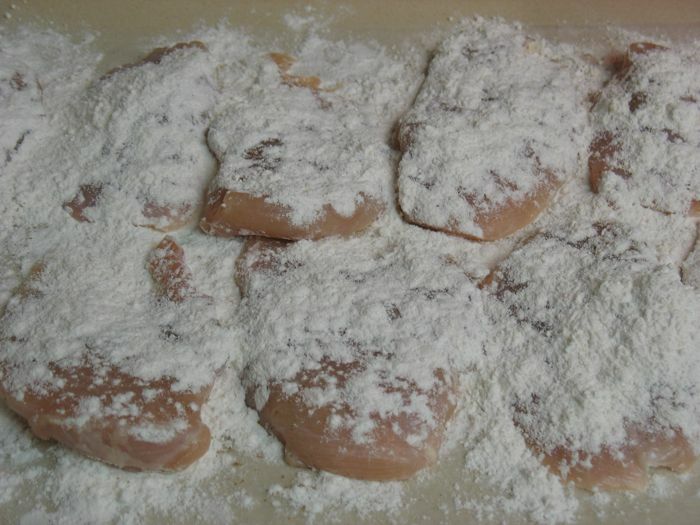 . . you know, when it says to pound the chicken fillets to a 3/8 thickness and you think you didn’t yet buy the food mallet, and should you try the one in the garage that you use to pound the paint cans closed? 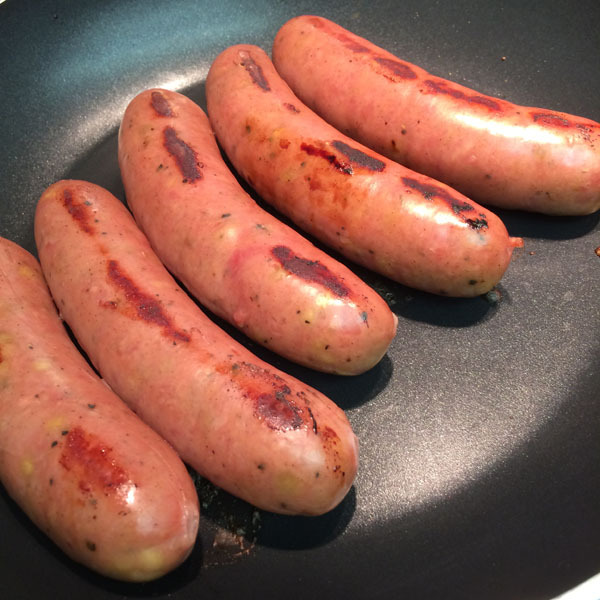 Instead you rummage through the gadget drawer and find the potato ricer–it’s the right shape and the right heft and it pounds the breasts into fillets nicely. Or when you go outside to snip the chives from the front flowerbed and you find the 15-year old patch has been weeded to within an inch of its life by the last set of garden workers, but (thankfully) you still find enough to use? That’s how it happens over here. Pound the chicken breast to 3/8-inch thickness. I like to lay down two pieces of wax paper, lay the chicken breast on that, then cover with a layer of plastic wrap. Pound, kind of mashing it this way and that, until it’s uniformly thinner. Slide your hand in between the two sheets of wax paper, and flip the chicken and its plastic wrap over, peel off the wax paper and replace on the first piece, then repeat with other three breasts. 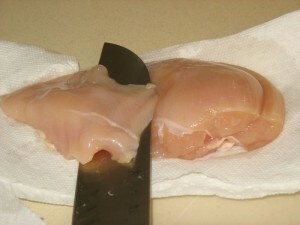 At the end, you’ll have 4 chicken flattened chicken breasts on their own piece of plastic wrap. 1) combine 1/2 cup of yogurt and 1 Tbs. mustard in one bowl, and add in the chopped chives. This is the sauce. Set aside to come to room temperature while you keep working. 2) combine 1/2 cup of yogurt and 1/2 Tbs. mustard in another small bowl. This is the coating. 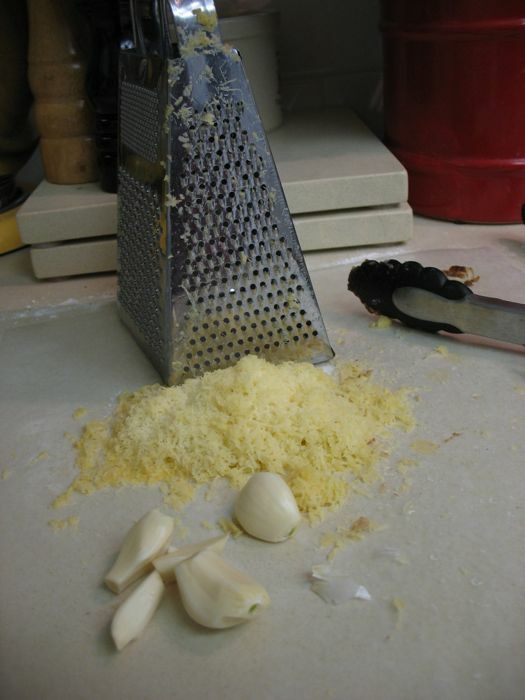 In a shallow dish, combine the bread crumbs and the grated cheese. Place the yogurt/mustard coating in another small dish. Sprinkle about 1 Tbls. (or less) chopped basil lengthwise down the pounded chicken breast; sprinkle with salt and pepper. Fold in the short ends of the breast about 1/2-inch. Starting at a long side, roll up the breast, enclosing the basil. Repeat with remaining breasts. Drizzle the rolls with the melted butter, then bake until the coating is golden brown and the chicken shows no sign of pink when cut in the center, about 25 to 30 minutes. Serve hot, with a dollop of the sauce on the side. 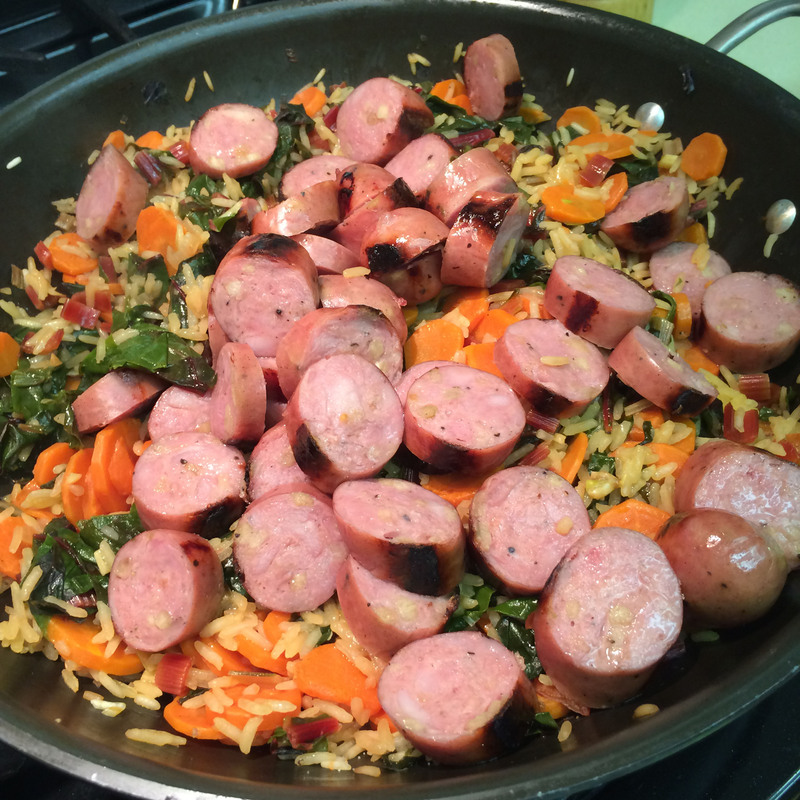 This was also good four days later, when we had it for leftovers after a weekend away and I didn’t want to cook. Who knows how I happened on this recipe, but given the fact that we live in the area where naval oranges are in abundance, it only made sense for me to find something to do with them besides squeeze them for orange juice. 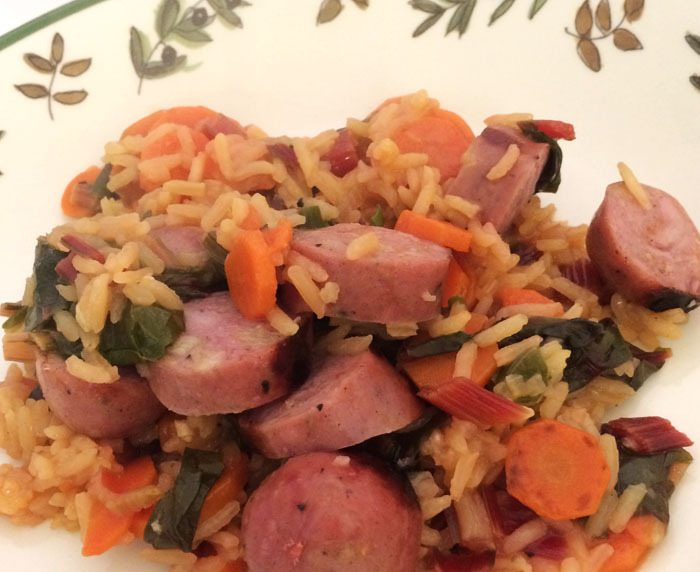 I like this recipe because it makes a lot, quickly, and it’s always a hit. 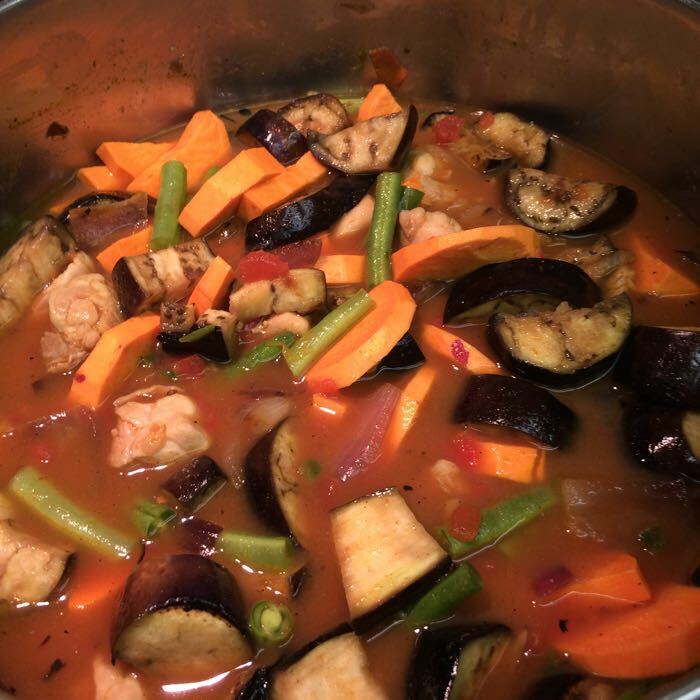 I’ve modified the originally published recipe with some of my own quirks–isn’t that how we all do things? *Note: I store my ginger root in the freezer, a trick taught to me by Susan Jones, an old friend. When I need some, I peel/scrape off the skin using a paring knife, then grate the frozen ginger using the fine-hole section of my box grater to get the amount I need. It’s shown above with the peeled garlic, ready for mincing or putting through a garlic press (I do that interchangeably). Since I believe that the chicken breasts these days have gotten out of hand, size-wise, I always “fillet” them by cutting them horizontally into thirds, as shown. Lay out the pieces on a double-layer of wax paper. Sprinkle chicken with salt and pepper; dust with flour. Turn over and repeat on other side, shaking off excess flour before transferring to pan. Melt butter with oil in large skillet over medium-high heat. Add chicken; sauté until brown, about 3 minutes per side. (They’ll cook some more in the next step, so no worries if the chicken is a little pink in some parts. I like to use my non-stick skillets for this step. 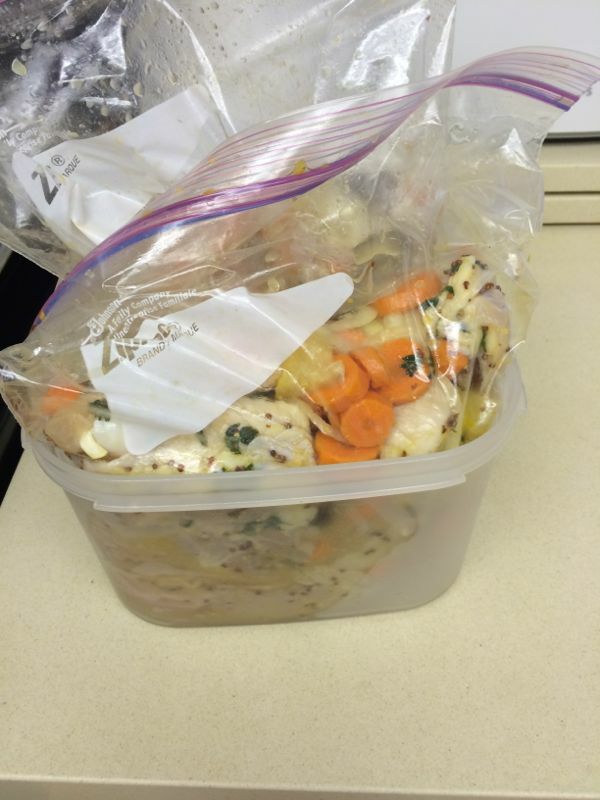 Transfer chicken to a stove-top lidded casserole pan, or other pan with sides. 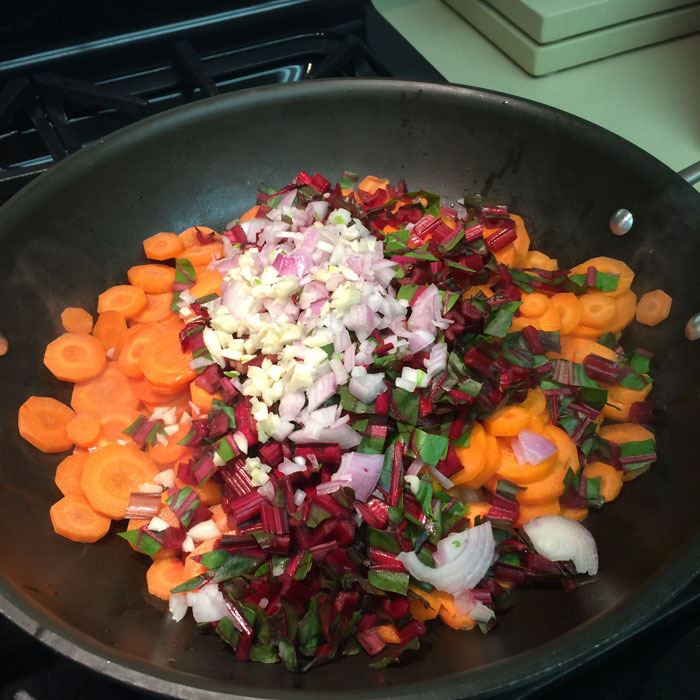 Add ginger to the original skillet; stir 1 minute. Add brown sugar and mustard and stir to blend into drippings. Add orange juice and orange peel. Cook until all the bits and little pieces have released from the skillet into the sauce and it is slightly thick, about 3 minutes. 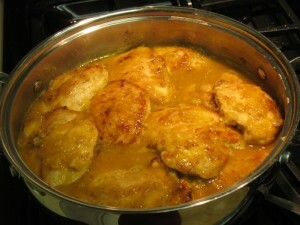 Pour over the chicken in other pan and simmer until chicken is cooked through and sauce is thick enough to coat spoon. Keep spooning it over chicken while it thickens up (anywhere from 6-10 minutes—don’t overcook chicken). Season sauce with salt and pepper. Transfer chicken and sauce to platter. Originally published in Bon Appetit Magazine; this recipe can be prepared in 45 minutes or less. 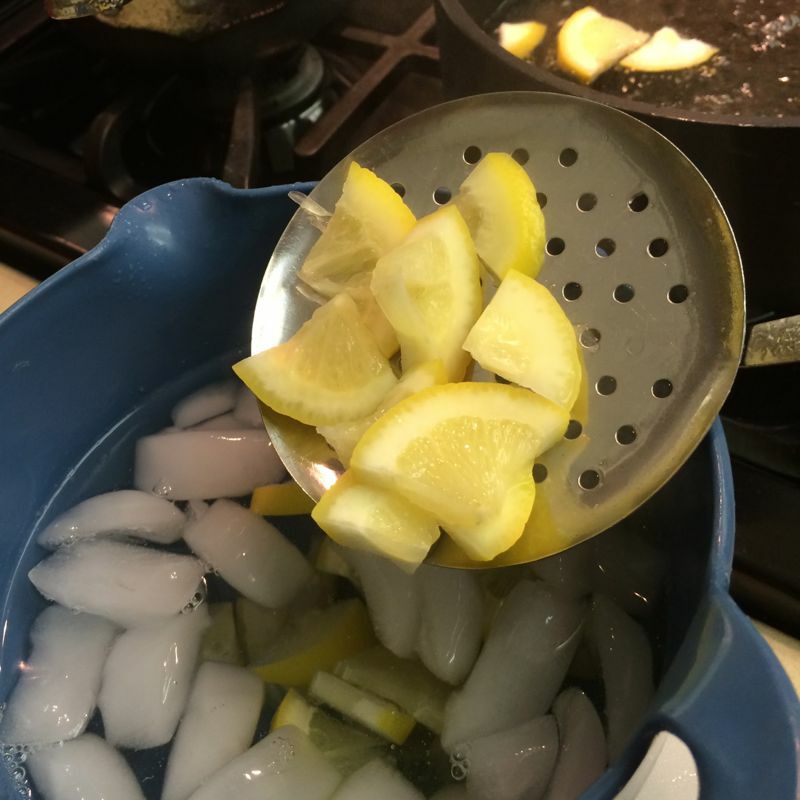 *Yes, you can just use one skillet, if it has a lid and steeper sides. 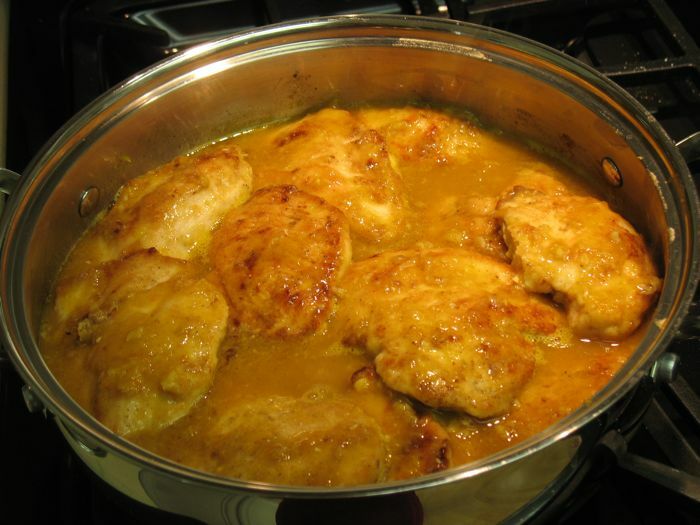 Transfer the browned chicken to a plate, then add back to the cooked sauce and cook as above. Posted in Chicken, Main Dish, Quick!